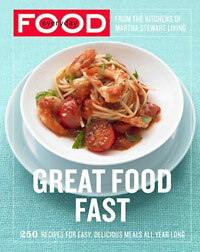 Great Food Fast is a collection of 250 favorite recipes pulled from the pages of the award-winning magazine published by Martha Stewart Living, Everyday Food. As with the magazine, the recipes are simple, delicious dishes meant for enjoying everyday. The recipes in Great Food Fast are arranged by season, after all that is how most of us tend to shop and eat and how our tastes most naturally run particularly when planning our family meals. Within each season the recipes are further organized by traditional categories with a healthy section devoted to Pastas. The layout and design is impeccable and most importantly a cinch to follow. Each recipe is given a full page with an accompanying colour photo. It is a stylish, easy to use book with a crisp, refreshing design. There are nice touches such as prep times and cooking times in bold to better plan your meal, lots of white space to allow you to add your own kitchen notes and colour tabs to identify each season. 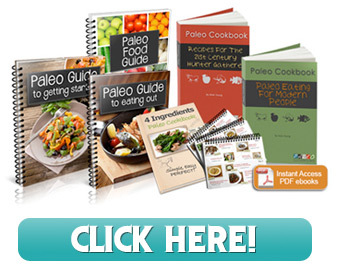 The collection of recipes – all easily prepared in no more than 30 minutes, include a great selection of light summer fare such as Turkey Cobb Salad; Spinach Penne with Ricotta and Pine Nuts; Strawberry Shortcakes; Roast Salmon with Lemon Relish and some family pleasing cold weather choices such as Parmesan-stuffed Chicken Breasts; Orecchiette with Sausage and Roasted Peppers; Chili-rubbed Skirt Steak and Curried Carrot Soup. The ‘Basics’ section at the back of the book give new cooks the building blocks of the quick kitchen – master a vinaigrette, chicken broth, easy chunk tomato sauce and perfect white rice, couscous, polenta and risotto and you are ready for whatever mealtime throws you. There really is something for every taste, every season, every day in Great Food Fast.